Richarlison, who made his debut as a second-half substitute in Saturday's 2-0 win over the USA, has scored three Premier League goals this season after moving to Everton in the summer in a £50m deal. Elsewhere, Argentina - who were without Barcelona forward Lionel Messi - drew 0-0 with Colombia in New Jersey. Four minutes before Adam's winner - his first international goal - Angel Zaldivar was shown a red card for a two-footed challenge on US captain Wil Trapp. 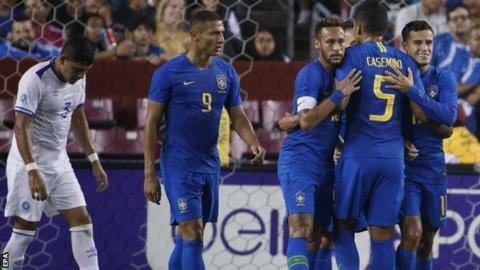 Match ends, Brazil 5, El Salvador 0. Second Half ends, Brazil 5, El Salvador 0. Foul by Lucas Paquetá (Brazil). Roberto Domínguez (El Salvador) wins a free kick on the right wing. Attempt missed. Andreas Pereira (Brazil) right footed shot from outside the box misses to the left. Assisted by Everton. Goal! Brazil 5, El Salvador 0. Marquinhos (Brazil) header from the centre of the box to the high centre of the goal. Assisted by Neymar with a cross following a corner. Corner, Brazil. Conceded by Bryan Tamacas. Attempt saved. Neymar (Brazil) right footed shot from outside the box is saved in the centre of the goal. Assisted by Willian. Óscar Cerén (El Salvador) wins a free kick on the right wing. Dennis Pineda (El Salvador) wins a free kick on the right wing. Attempt saved. Everton (Brazil) right footed shot from the right side of the box is saved in the centre of the goal. Assisted by Felipe. Corner, Brazil. Conceded by Narciso Orellana. Corner, El Salvador. Conceded by Alex Sandro. Delay in match Willian (Brazil) because of an injury. Attempt saved. Everton (Brazil) right footed shot from the left side of the box is saved in the centre of the goal. Assisted by Neymar. Substitution, El Salvador. Ibsen Castro replaces Andrés Flores Jaco. Attempt missed. Neymar (Brazil) right footed shot from outside the box is close, but misses to the left. Assisted by Lucas Paquetá. Narciso Orellana (El Salvador) is shown the yellow card for a bad foul. Felipe (Brazil) is shown the yellow card for a bad foul. Dennis Pineda (El Salvador) wins a free kick on the left wing. Substitution, Brazil. Andreas Pereira replaces Arthur. Attempt saved. Lucas Paquetá (Brazil) right footed shot from outside the box is saved in the bottom right corner. Assisted by Willian. Eder Militão (Brazil) wins a free kick in the defensive half. Foul by Dustin Corea (El Salvador). Substitution, El Salvador. Moisés Xavier García replaces Arturo Álvarez. Delay in match Bryan Tamacas (El Salvador) because of an injury.